I’ve been asked when it’s okay, and when it isn’t, for an installment seller to borrow money at the same time as the installment-sale transaction. The question is essentially this: Can the loan be deemed by the Internal Revenue Service to be sale proceeds, so that the seller is treated as having sold for cash? Here’s my short response: It depends. Here’s my longer answer: Stay on the right side of these important (and, in part, rather obvious) guidelines, and your loan should not be at risk of being treated as just a sneaky way of getting cash without having a cash sale. Keep this objective in mind: The substance of the sale, not just the form, must be an installment sale. The substance of the loan must be a real loan, not just a substitute for a cash sale. If you assign the installment contract to your lender, or give the lender a security interest in the installment contract, your doing so will have the same effect as if your sale were a cash sale. Under the statute, an assignment or pledge of an installment contract is a "disposition" (a sale) of the installment contract, and the IRS is authorized to treat that as full payment to you of the amount owing on the installment contract, even if you haven’t been paid in full. So, don’t assign the installment contract or give anyone a lien on it. Just as with a disposition of an installment contract, borrowing against your installment contract will cause your installment sale to be deemed to have been a cash sale. The rationale is clear: you sold on an installment contract, but then you borrowed money and used the contract as collateral. That, too, counts as a "disposition" of the installment contract. It’s fine to list the installment contract as an asset on your financial statement when you borrow money, but don’t borrow specifically against the installment contract. You should remain the sole owner of the installment contract and not give your lender ownership rights in the installment contract. The installment contract should remain as an asset on your balance sheet, for the full duration of the installment contract. The installment contract should not be on the lender’s balance sheet. You should arrange things so that the installment payments go into your account, as your money. That doesn’t mean that the installment payments necessarily have to go into the same bank account where you keep your other money, but the payments should go to an account that is yours and that has your name and tax number on it. You should arrange things so that the payments on the loan come from your account and your funds. That can be a special account, but it must be your account, with your name and tax number on it. Things should be arranged in such a way that you are assured that the IRS and you will receive a 1099 each year to show the installment payments that are made to you by the buyer, and that the IRS and you will receive a separate 1099 each year to show the loan payments that you make to the lender. Those are required, so be sure the process is in place. Be sure that both the installment contract and the loan are fully documented. Then comply fully with the terms and conditions. Also, it’s a good idea to have those documents state explicitly what your substantive business purposes (as distinct from any tax benefits) are for entering into those agreements. That’s valuable for yourself later, if you someday wonder, "Why did I do this?" It’s valuable, also, in the event of a tax audit, because your real business reasons will be right there for the auditor to see and understand. Of course, be sure that your attorney reviews the documents on your behalf. Be sure that the loan documents identify your business purpose for the loan. That’s important for your ability to deduct the loan-interest payments. 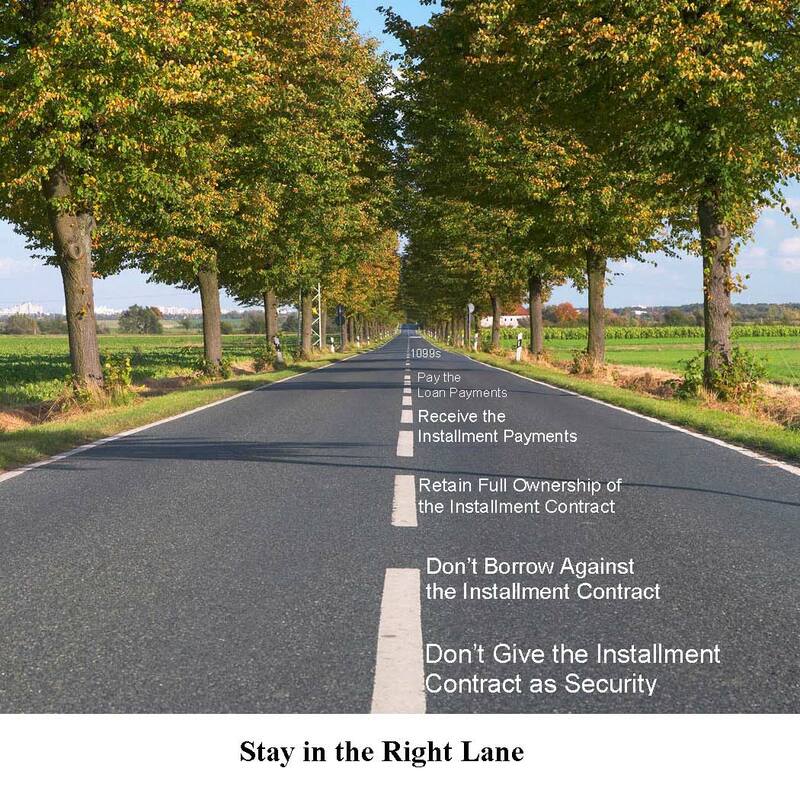 It’s important for the lender, if the lender is not in the consumer-finance business. If one of your uses of the money will be to pay business debt, be explicit that the money is for refinancing purposes. Borrow only from an established lender. That goes a long way toward assuring that the loan will be—and will be seen to be—a real deal. Borrow only from a lender which is independent of you, and independent of your installment buyer: someone you don’t control, and someone your installment buyer doesn’t control. In case you might wonder, I can tell you: S.Crow Collateral Corp.’s "collateralized installment sale" transactions comply with all ten of the above guidelines.